Join the discussion on our forums! 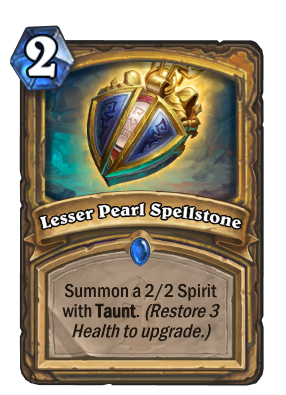 Come discuss Lesser Pearl Spellstone over in our dedicated Lesser Pearl Spellstone discussion topic. In ages old, when Ancients broke Azari of the Legion spoke To tempt the mortals: gems of power The weak succumbed, their souls devoured. 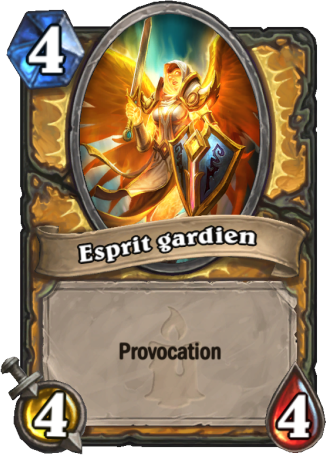 So Paladin was suposed to be Anti-Aggro... How ironic! Okay this might be a game changer. The card says restore 3 health to upgrade. And not restore 3 health to your hero. SO THAT MAKES THIS VIABLE IN SOME KIND OF AGGRO HEAL UP YOUR MINIONS WAY!!! Against control decks you will hardly have a chance to heal your self to upgrade this to a point that it matters. vs aggro, build a deck around it, this card is great against face decks. 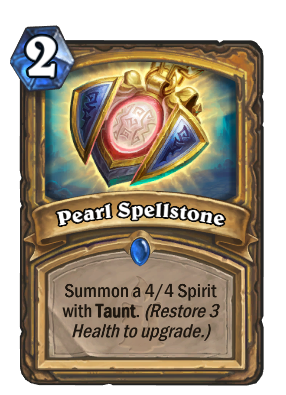 I suppose if nothing else, Lesser Pearl Spellstone is essentially an Internet meme made into a card. 2/2 Taunt for 2 Mana? I sleep. 4/4 Taunt for 2 Mana? Real sh*t? 6/6 Taunt for 2 Mana? A S C E N D E D ! ! ! What about Ragnaros, Lightlord, Uther of the Ebon Blade, Lay on Hands, Forbidden Healing or even Ivory Knight? Don't forget Chillblade Champion, Wickerflame Burnbristle, and the new Paladin minion Benevolent Djinn. This card is a sleeper in the set, and people shitting on it now don't realize how easy it is for Paladin to get the most out of the Spellstone. 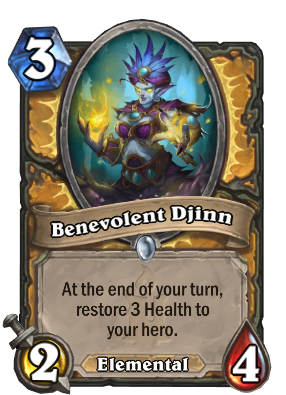 Hell, the Djinn's end turn triggered twice is enough to fully upgrade it. 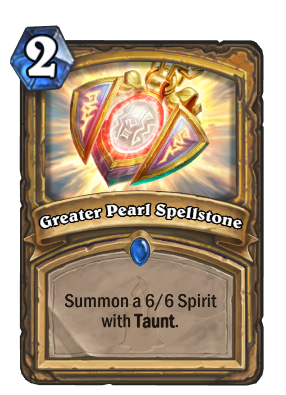 could be a lot better and on par with other gemstone if the card is 3/3, 6/6, then 9/9 taunt. Brode: Ok let's find a new identity for Paladin since the murloc thing is over. 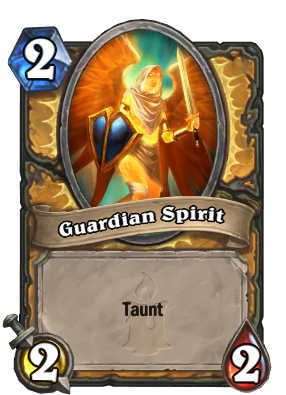 Should we focus on weapons, healing, or taunt minions? Brode: I said "or" not "and." Here are the artwork for the Guardians. Sorry the images are a little bit big. 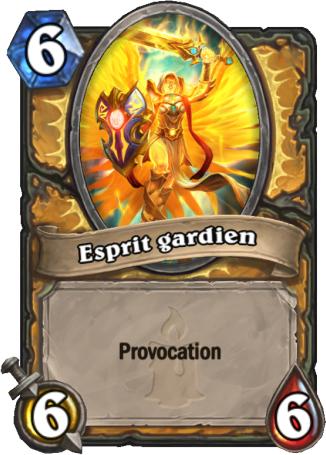 Provocation is the French keyword for Taunt. 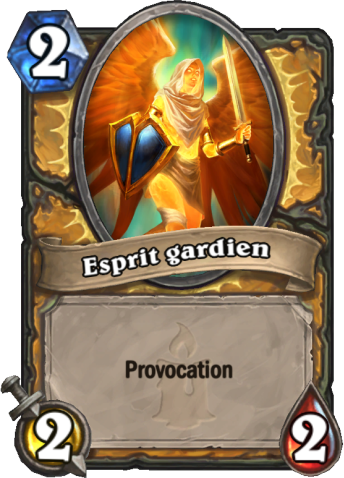 "Esprit gardien" most likely means "Spirit Guardian" or "Guardian Spirit". PSA: Some French site found the images for the upgrades, and it actually upgrades from a 2/2 to a 4/4 to a 6/6, not increasing amounts of 2/2s. Were this the priest spellstone, it would be busted. Instead, it has synergy with the new Paladin 3 mana 2/4 that heals 3 health each turn. Why complain that Blizzard is trying to implement synergy to promote new mechanics?